Might not be the best picture I've ever taken, but this was so yummy good! Amounts are approximate, I never measure. 1 Heat gravy in a skillet until bubbly. If the gravy is too thick, thin with a little stock or water. 2 Add pieces of sliced cooked turkey meat to the gravy. Coat with the gravy on all sides and heat until the meat is heated through. 3 Arrange a slice of bread (rustic French or Italian loaf would work great) on a plate. 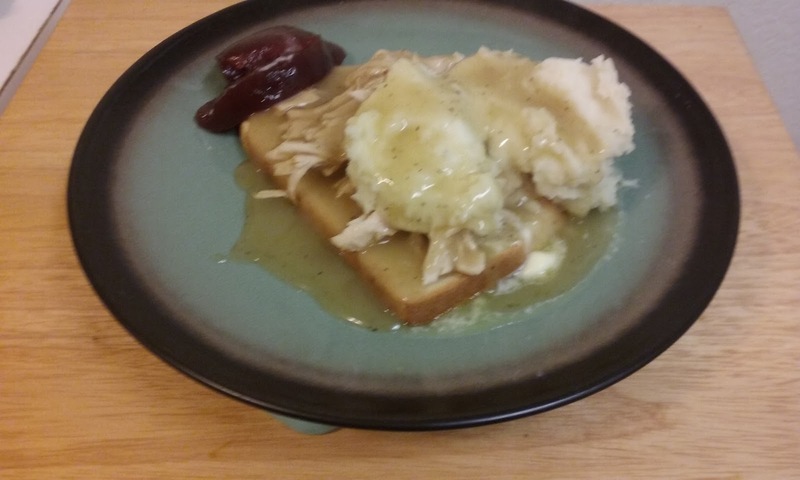 Top with sliced turkey, gravy and top with mashed potatoes. And of course don't forget the cranberry jelly!